Complete plug and play ProBEAM® LED front and rear turn signal conversion kit for 2010-2013 Harley-Davidson® Street Glide (FLHX) and Road Glide Custom (FLTRX), 2009-2011 Street Bob (FXDB) and Wide Glide (FXDWG), and 2010 CVO™ Softail Convertible (FLSTSE2). Front turn signal lenses: ProBEAM® Amber/White Dynamic Ringz™include smoked lenses; ProBEAM® Solid Amber LED Turn Signals include amber lenses. Rear turn signal lenses: ProBEAM® Red Bullet Style Lenses included. 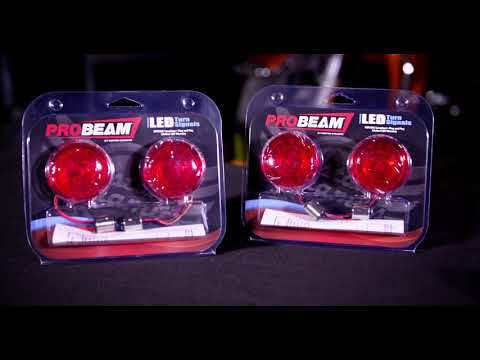 Purchase ProBEAM® Smoke Lenses (sold separately) to use with ProBEAM® Red LED Turn Signals. The Red LEDs will continue to provide red illumination through the provided red lens or through a smoked lens. Install with ProBEAM® Bullet Bezels (sold separately) for a custom finish to your turn signal housings. 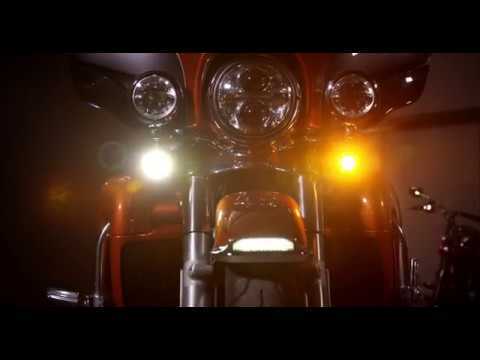 Fitment includes US Harley-Davidson® models equipped with Bullet Style dual intensity 1157 rear turn signals. SMART Signal Stabilizer™ required on these models to maintain proper speed of turn signal flash. ProBEAM® 1157 Red Ring LED Turn Signals are NOT compatible with Custom Dynamics® LED TriBAR for 2010-2013 Street Glide®/Road Glide® Custom Models. Plug & Play on 2010-2013 Harley-Davidson® Street Glide (FLHX) and Road Glide Custom (FLTRX), 2009-2011 Street Bob (FXDB) and Wide Glide (FXDWG), and 2010 CVO™ Softail Convertible (FLSTSE2). SMART Signal Stabilizer™ or Load Equalizer is required on these models to ensure proper function and flash speed of LED Turn Signals. Rear 1157 ProBEAM® Turn Signals are NOT compatible with Custom Dynamics® LED TriBAR for 2010-2013 Street Glide®/Road Glide® Custom Models. Add a Magic Strobes™ Brake Light Flasher to add 10 User Selectable patterns to the brake signal for added visibility.